Today’s organized customers are more complex than ever and our training will help your sales teams navigate hospitals, ACOs, IDN’s and multi-group physician practices while providing context for understanding what influences key decision makers in each. The emphasis on containing healthcare costs by reducing the length of hospital stays helped fuel the growth in alternative care settings. Such settings are important components of the continuum of care and are the focus of this module. They include long-term care facilities, hospice care, and ambulatory/outpatient settings. This module discusses the changing role of acute care hospitals and the growing role of post-acute providers, especially home care, hospice, and skilled nursing facilities. This module discusses hospital accreditation and describes the different types of hospitals within the healthcare community. It discusses key hospital personnel and highlights current trends in the hospital environment. In integrated care organizations, decisions made in the C-Suite are applied across the care continuum. As these organizations are becoming central to our healthcare system, you are being asked increasingly to demonstrate your company's strategic value to their C-Suites. This module explains how integrated care organizations are reshaping the way life science sales teams conduct business. Then it describes a sales process that will help you succeed in the C-Suite environment. This module explains how integrated care organizations are reshaping the way MD&D sales teams conduct business. Then it describes a sales process that will help you succeed in the C-Suite environment. This module provides the foundation you need to succeed in the C-Suite environment. It examines the types of healthcare organizations that comprise a C-Suite target audience and identifies the key goals they share. It also profiles the C-Suite occupants and discusses how their individual goals connect with those of their organization. This module focuses on the increased integration and consolidation occurring among provider organizations and insurers. As described in this module, integrated delivery networks (IDNS), sometimes referred to as integrated delivery systems or provider networks, come in all different shapes and sizes, and they are formed through various types of formal legal structures as well as informal partnerships. This module will compare IDNs to Accountable Care Organizations (ACOs). It describes the features of these models. This module focuses on the increased integration and consolidation occurring among provider organizations. Hospitals, physicians, and other providers are partnering to better ensure they can provide high-quality, lower-cost care in a coordinated manner across the care continuum (eg, primary care, specialty care, hospital care, post-acute care). 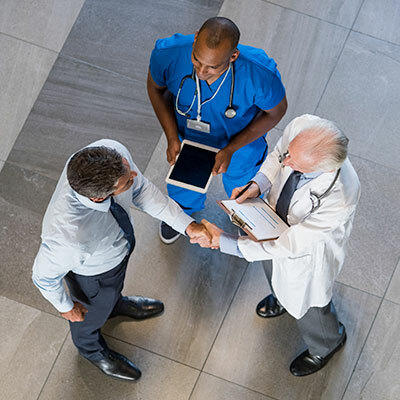 At the same time, there is increasing competition among providers for contracts with commercial payers and employers, which are looking to form networks of care with those providers that can deliver value (quality ÷ costs) to patient populations. This Micro Minute outlines the characteristics of Accountable Care Organizations and describes the quality metrics used to measure ACOs. This module asks targeted questions to help you get started with a specific ACO account. This Micro Minute discusses the important and unique functions offered by acute care providers. This module also outlines the common criteria for categorizing acute care hospitals, including: 1) size/number of beds, 2) Ownership & Management and 3) Functions & Services. This Micro Minute details the shift toward outpatient care settings, and the ever-evolving role of the medical groups due to the focus on value-based care. In addition, this module covers the move from fee-for-service to fee-for-value regarding physician compensation, as well as some common tools and strategies being utilized by many medical groups today. This Micro Minute uncovers the organization of the hospital structure and the common departments you will encounter within. This module also includes some helpful tips to consider as you build and develop a relationship with your hospital accounts. This Micro Minute describes the characteristics of Integrated Delivery Systems and reviews common IDS models. In addition, it discusses current challenges for IDSs and opportunities these challenges offer sales professionals. Finally, the application tools included in this module will help you understand the needs of specific accounts and identify the strengths weakness, opportunities and threats for your partnership. This Micro Minute describes the facilities and personnel that serve patients who need ongoing health, mental health, and social support services over an extended period. This Micro Minute describes the various forms of Managed Care Organizations through the years and how, though a variety of cost cutting strategies, this provider type has offered an alternative to fee-for-service care. When calling on hospitals, sales representatives need to understand the web of departments, divisions, and units within these highly complex organizations. This module describes the key medical and administrative areas in a typical hospital, as well as their primary functions. Business acumen and customer insight are two of the most important competencies for account managers who call on organized providers. These skills help account managers forge lasting relationships focused on achieving mutual goals with their customers. This application tool is designed to help you better understand the needs of your accounts so you can confidently make the business case for a potential partnership with an integrated delivery system (IDS), an accountable care organization (ACO), or a large medical group. As healthcare delivery in hospitals continues to adapt to rapid market changes, the approach to selling in hospitals must also adapt. You already know the driving forces, an emphasis on cost and outcomes, coordinated patient care, value-based payment models, financial penalties, "meaningful use" EHRs, and population health management (PHM), to name a few. This module explores today's hospital environment and what it means for selling life-science products and services. Throughout, you will be asked to consider the impact to your own accounts. This module explores today’s changing hospital environment and what it means for selling products and services. Throughout, you will be asked to consider the impact to your own accounts. Accountable care organizations (ACOs) are a key component of healthcare reform. This module covers the establishment of accountable care organizations and explores their potential impact on medical device and diagnostic (MD&D) companies. Thought Leader Insights are a collection of podcasts that give you a glimpse into the discussions that industry leaders are having on important topics. In this collection, industry experts identify opportunities to align company and customer goals, and discuss joint business planning strategies for sales, training, and marketing. Thought Leader Insights are a collection of podcasts that give you a glimpse into the discussions that industry leaders are having on important topics. In this collection, experts from leading health systems and training organizations detail what's changing inside hospitals as they face continued competition and financial pressures, combined with uncertainty about healthcare reform. Thought Leader Insights are a collection of podcasts that give you a glimpse into the discussions that industry leaders are having on important topics. In this collection, industry experts discuss some of the strategies that healthcare sales professionals can use to provide more value to CEOs, CMOs, CFOs, and other C-Suite executives. This module discusses the trends affecting medical groups and how life science companies can build more meaningful partnerships with these important customers to help protect market access. This module discusses the trends affecting medical groups and how medical device companies can build more meaningful partnerships with these important customers to help protect market access. Integrated care organizations make decisions in the C-Suite and then apply those decisions across the entire care continuum. There is less emphasis being put on your products and more emphasis being placed on your company's ability to help hospital systems achieve their strategic goals. Inside the C-Suite: Getting a Seat at the Table will help you develop the consultative skills necessary to make successful sales calls within integrated delivery systems.